Nitrogen is the most used and least understood of all agricultural inputs. It is well known that typically only a third of applied N taken up by crops. However the effect form of N has on how and where crops grow is less well understood, and offers great potential to increase yields. Nitrogen can be taken up as amine (NH2), Ammonium (NH4) or nitrate (NO3), but due to conversion by bacteria the vast majority of N applied to crops is taken up as nitrate. 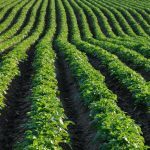 It is nitrogen uptake that dictates how fast and where crops grow, with nitrogen form being the main contributor to growth hormone synthesis in crops. Nitrates encourage auxin production, favouring vegetative growth (top growth of shoots), whilst amine nitrogen encourages cytokinin production, favouring reproductive growth (the growth we harvest). When we feed crops N, they mostly take it up as nitrate (no matter what form it is applied in), which means plants mostly use their N to put on top growth. 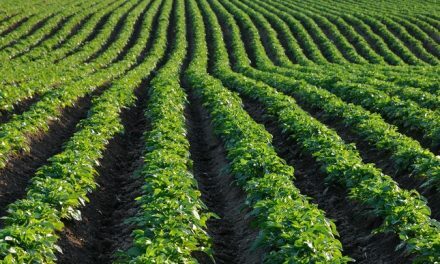 In crops like potato, farmers must manage conflict between applying the N their crop needs, and the crops natural propensity to use that N to grow foliage rather than tubers. This leads to a reduction in tuber setting and bulking. Levity Crop Science have developed Lono for Potato, a foliar applied product that exposes the crop to bursts of amine N, which helps to direct growth towards tuber development. Research shows that exposure at key growth stages have an effect on where the crop puts its resource, Lono for Potato exploits this, encouraging better tuber setting and development. By applying 3-5 5lt per ha applications at tuber initiation and through bulking, the crop is made to focus growth where it counts… on tubers. The product keeps the plant green, reduces effects of drought, and ensures adequate tuber numbers and bulking. David adds “in our trials in the Netherlands in 2015 it was a drought year. Our plots were greener all season, and you could see obvious green squares in pictures taken by drones. This ability to grow through stress really showed up in yield”. Independent trials in the Netherlands during 2015 on the variety Innovator showed an increase in tuber numbers just short of 63,000, with 6.1 MT extra marketable yield. Last season further independent trials in the UK and Ireland have shown a similar increase on Rooster (5.5MT) and Sassy (6.2 MT). Levity is using knowledge of how plants grow, to create inputs which make the most out of crops like potato. By properly understanding how potatoes divvy up their resource we have developed Lono for Potato, a product that ensures the crop focuses on developing tubers not leaf. The product is used by growers across Europe and North and South America to maximise yield and quality. Lono is proven to work in British, Dutch, Irish and French trials. You can find out more about potatoes, Nitrogen, and how Lono can help improve crops at two upcoming trade events Potato Industry Event BP2017 in Harrogate 22-23rd November 2017, and CropTec in Peterborough on 29-30th November 2017. A scientist and entrepreneur David is the founder and MD of Levity Crop Science. David specialises in nutrient use efficiency, getting more efficacy out of the inputs we apply to crops.